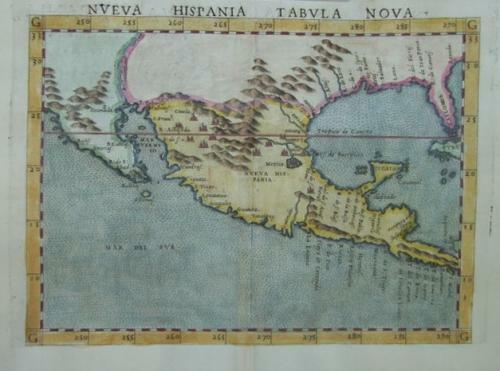 Title: 'Neuva Hispania Tabula Nova'. An early map of Mexico and the southern USA. An enlarged version of Giacomo Gastaldi's map of 1548, except that the Yucatan is no longer shown as an Island. It is the second earliest obtainable map of the Southern half of the US. Not until Wyfliet's maps of 1597 would a better regional representation appear in a printed map. R. Spiritu Santu appears (Mississippi River). California is showns as a Peninsula. The R. Tontonteanc is either the Gila or the Colorado River. Florida and Cuaba are named. The placenames reflect the explorations of Pineda, Cabeza de Vaca, and Moscosso. Perhaps the most influential map of the southwest during the 16th Century.